Happy Wednesday! It’s a great day! I was able to go to the gym this morning, have a great workout, see some lovely faces and come home to my sweet Lacey. It was also a great day for my figurine. Thanks to a little E6000 glue, he is back in one piece! It all began last week when I repainted a large mirror for my bedroom. I used white chalk paint and a dark wax to completely transform the look of the mirror. I loved it! (You can read about how I painted the mirror on the blog.) But after I hung it, tragedy struck. At least it struck one of my antique figurines. The wire on the back of the mirror broke, the mirror fell and busted this little guy into 3 pieces. Sad! I’m actually amazed he was the only casualty. I started to toss him in the trash, but he is one of a pair and I thought it would be a shame for his wife to live alone after being together for so long. Here is how the mirror and the couple looked moments before “the accident”. So, I grabbed my favorite glue, E6000 and glued the little fellow back together. The beauty of this glue is it is sort of thick so it gets into all of the nooks and crannies. And it dries quickly and clear. (This glue is officially my go-to glue for all of my projects.) I glued the middle piece to the base first and held it into place for a minute or so. Then I reattached his head. There was an obvious line where his head reattached to the body, so I borrowed a scarf from a snowman leftover from Christmas. 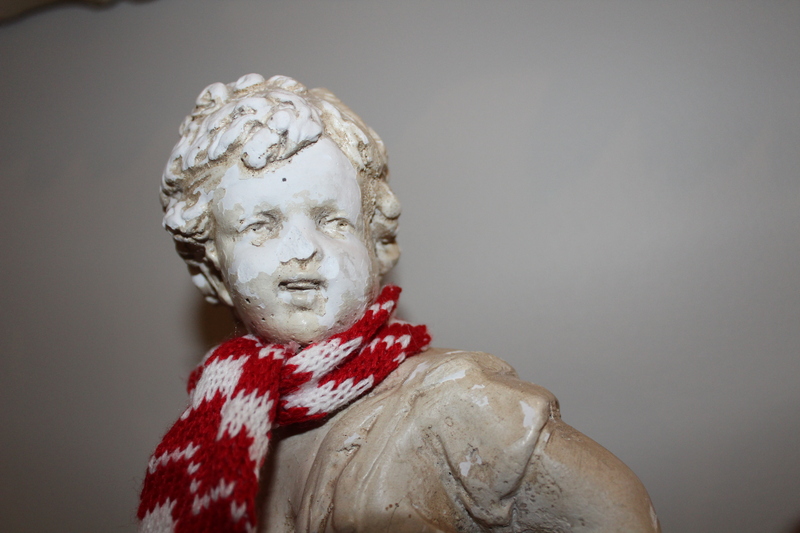 I think he looks quite dashing in his new scarf! Now he is stylish AND warm. I think the look on his noseless face says it all. He’s just glad to be back!